TOKYO, Japan — Starbucks Coffee Company has presented the company’s key initiatives that will accelerate its sales and profit growth, as well as elevate the customer experience in Japan. Starbucks remains committed to building deeper customer relationships, expanding digital innovation, enhancing its unique coffee experience and strengthening local communities. Supported by these initiatives, the company announced plans to build 100 net new stores annually over the next three years in Japan – a goal that will bring the store count to 1,700 across the market. “The strength of our brand in Japan, the momentum in our business, and the spirit of our partners who proudly wear the green apron give me great confidence in our ability to elevate the Customer Experience and drive growth to continue to build our brand,” said Kevin Johnson, Starbucks president and chief executive officer. “Starbucks Japan was built as a performance-driven company, guided through the lens of humanity, from the time of our first store opening in Tokyo in 1996,” said Takafumi Minaguchi, chief executive officer, Starbucks Japan. Starbucks digital flywheel in Japan is the foundation that will help enhance the third-place experience, earn customer loyalty and foster customer connection for the long-term. The portfolio of innovative digital offerings will provide customers uniquely rewarding and convenient ways to enjoy the Starbucks Experience, including delivery, digital ordering, cashless payment, rewards and personalization. Beginning November 9, Starbucks will launch its Starbucks Delivers program in partnership with Uber Eats Japan to deliver Starbucks beverages and food items direct to customers. The pilot program will begin in three stores in Tokyo, two in Shinjuku and one in Roppongi, with plans to scale the program within two years. Starbucks intends to capture the rapidly growing delivery market in Japan by bringing the unparalleled Starbucks Experience to customers wherever they are. Leveraging its unique combination of Starbucks stores and breakthrough mobile technology, Starbucks also unveiled a strategic collaboration with LINE, Japan’s leading social platform, to innovate across various technologies, including digital payment. The partnership will result in exciting innovation, with the first phase launching in the first half of 2019, connecting Starbucks to LINE’s more than 78 million users across Japan. Additionally, building on the program’s success in the U.S. and select markets around the world, Starbucks Japan will begin a pilot of the Mobile Order and Pay program in 2019, enabling customers to order and pay from their mobile device, and pick-up in store, skipping the line. Through the industry leading ‘STARBUCKS REWARDS™’ loyalty program, which launched in September 2017, digital transactions and cashless payments now represent more than one quarter of all customer transactions at Starbucks, as members enjoy the convenience and speed of the Starbucks Card and the Starbucks mobile app. This year, the company expanded this digital experience by inviting customers to donate the monetary value of their Starbucks Reward to programs supporting communities impacted by natural disasters, including scholarships for orphans of the 2011 Tohoku earthquake and tsunami and coffee farmers impacted by the volcanic eruption in Guatemala this year, a first for the Starbucks Rewards program globally. Building on 22 years of service to Japanese customers across the market, and Starbucks 47-year history of sourcing, roasting and brewing the finest coffees from around the world, Starbucks today announced it will open the Starbucks Reserve Roastery in Tokyo on February 28, 2019 in the upscale Nakameguro district. 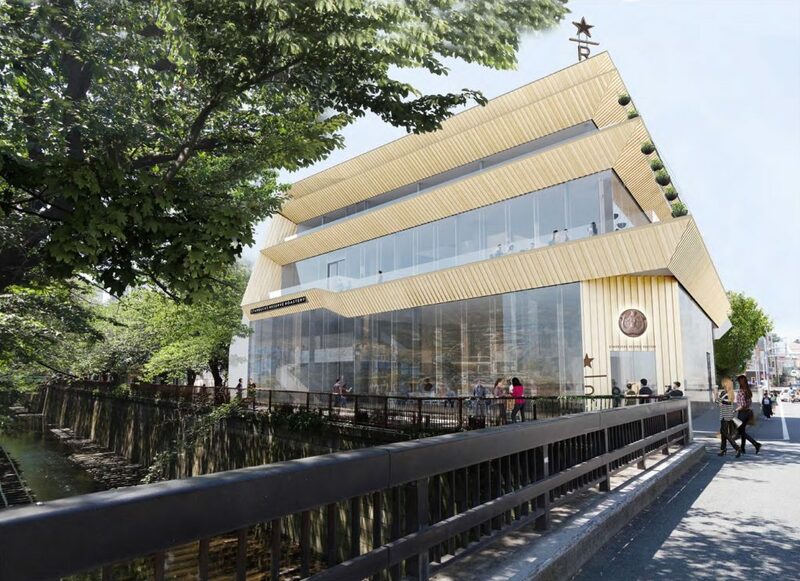 Starbucks fifth Roastery globally, the Tokyo Roastery will be the first of its kind, designed and built from-the-ground-up in collaboration with world-renowned architect and Kuma Lab founder, Kengo Kuma. The Roastery is the pinnacle coffee experience, highlighting Starbucks uncompromising pursuit of high-quality coffees and immersive retail innovation. Starbucks commitment to the customer experience in Japan is rooted in the deep belief that a company must take care of the communities it serves, a focus for the company and a passion shared by the more than 30,000 partners (employees). In July, Starbucks announced plans to eliminate single-use plastic straws across all 28,000 stores globally by 2020. Today, Starbucks Japan announced plans to align to the global goal by fully transitioning to the strawless lid and alternative-material straws by mid-2020. This transition will begin in spring 2019 with an alternative-material straw in all Starbucks Reserve Bar stores and the Tokyo Roastery, as well as introducing the strawless lid for all tall iced beverages across the entire store portfolio. By mid-2020, all iced beverages will be served with the strawless lid and an alternative-material straw will be available for Frappuccino Blended Beverages and upon request. Starbucks today operates 1,392 stores in Japan across all 47 prefectures, making it the fourth largest market in terms of store count for Starbucks globally. Starbucks remains committed to making locally-relevant investments for its Japanese partners, customers and communities to further elevate the Starbucks Experience globally.